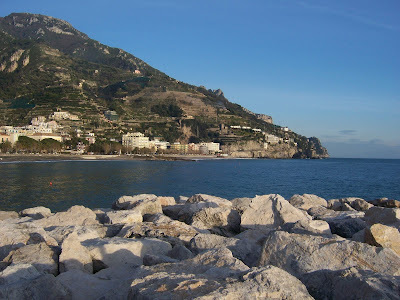 On Thursday the rain stopped and we woke up to a beautiful, sunny morning on the Amalfi Coast. The perfect day to be out enjoying the good weather! After traffic delays due to road work and work cleaning the rocks on the mountains, we missed the boat to Capri from Sorrento. So instead we walked around Sorrento, and then took a beautiful drive from Sorrento through Massa Lubrense to the very tip of the Amalfi Coast. 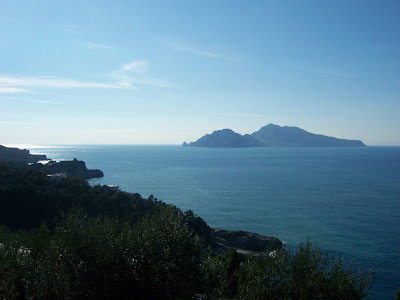 From there we drove up through Termini, Nerano, and up to Sant’Agata sui due Golfi, where there is an incredible view of the Bay of Naples and the Gulf of Salerno from one point. Along the way we had incredible views of Capri. The one above was taken not far from Massa Lubrense, and you can see how close Capri is from the tip of the Amalfi Coast. 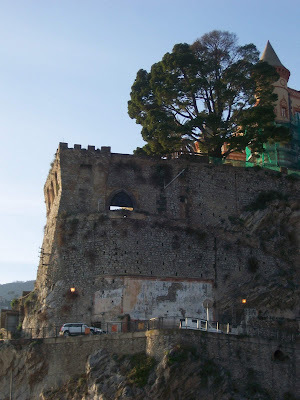 (It is about a half hour boat ride from Sorrento.) I have many photos of the cities we drove through and scenic points we stopped at, and I will be posting some of those in this coming week. Unfortunately, the cold and rainy weather is coming back this week. In the meantime, Thursday was a beautiful reminder of the good weather that will be coming soon! We we arrived in Sorrento I noticed Vesuvius had just a little bit of snow at the top. This was taken from the Marina Piccola in Sorrento. The tops of the highest of the Lattari Mountains along the Amalfi Coast also have some snow now. I have decided to combat the oppressiveness of the current bad weather by making plans for when the weather improves. I have yet to be to Capri off season, and I have been anxious to see the island during the winter without the crowds of tourists. Unfortunately, that also means missing much of the life that exists as a result of the tourists. Many shops and restaurants are closed this time of year, and you do lose something of the life and activity of the place. Although people may complain about the massive influx of tourists during the summer months, one has to admit that Capri, much like the Amalfi Coast, has changed. The tourists have become part of life here, and I don’t mean that in just an economic way. Yes, tourism is an essential part of the economy here. But life has changed in certain ways to welcome the tourism, or as a result of the tourism, depending on your point of view. This change comes in some good ways and in some bad ways. Yet, there is something lovely about this quiet time of year here on the Amalfi Coast. I liken it to when the leaves fall off the trees in autumn and you see new views that you missed all summer. When all the clutter of the tourism and all that goes along with it disappears, what you are left with is the underlying life of this place. It is there year round, but it is simply easier to see now. To see life the way it is lived in all its small ways. This is what I want to see on Capri. 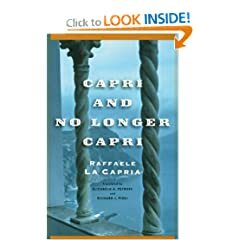 “If you do not dream the world before you see it, then you cannot see it.” It is the same with Capri: you cannot see it unless you have first dreamed it. Only in this way can it appear before you as the mythical place where Nature first encountered Beauty, as the purest image of the sea that was once the cradle of the gods, as that island from which Ulysses heard the Sirens’ song. 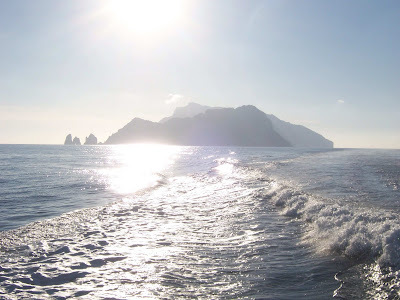 And so I have begun dreaming Capri in preparation for seeing it when the weather improves. I have also been reading a book called Capri Blossoming by Tullia Rizzotti, which I picked up last autumn at the little bookshop at the Villa San Michele in Anacapri. It is a great resource with beautiful illustrations, and I love how it is organized into chapters of botanical walks. Since I am on the topic of books, I wanted to point out that I added a gadget froom Goodreads over on the left showing my “Currently Reading” bookshelf. It is a website I have just started to use, but I hope to have time to keep it up in the future. 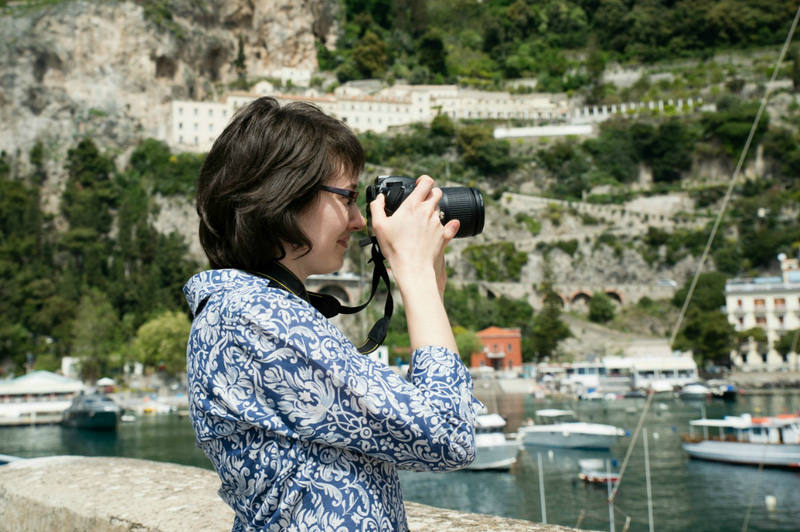 I have my fingers crossed that the weather will improve later this week or the weekend for a day trip to Capri! While graffiti is far from a laughing matter for me, I have to admit this new piece of graffiti near the parking in the port of Amalfi made me smile yesterday. Then I was angry, but first I smiled. Anyone who knows my research past with the Duomo of Amalfi will understand why I smiled at this graffiti representation of it. But this piece of graffiti represents and new and much larger problem. 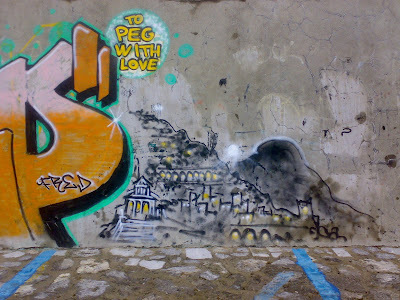 Graffiti is starting to show up around the port of Amalfi, especially in the past month and a half. This is just a disgusting and disappointing thing to me, and it worries me that it will continue to spread. Will Amalfi soon look like Naples, where no major building or statue is free from graffiti? I certainly hope not! And still it rains! 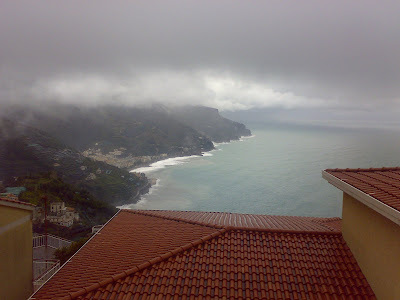 It has rained so much in the past month that things are starting to go a bit downhill here on the Amalfi Coast. Unfortunately, I mean that literally. The unrelenting rain is causing walls and terraces to crumble into the roads, and in some locations mudslides are causing more serious damage. The road connecting the coast to Salerno through Vietri sul Mare was closed earlier today due to rocks and mud in the road. The sea is quite rough here, as you can see in the photo above that I took quickly on my phone earlier today. The waves down in Amalfi were impressive and powerful, and I think I saw just about the biggest wave in my life today as it crashed against the watchtower in Amalfi. Unfortunately, there is very sad news on the Amalfi Coast this evening. 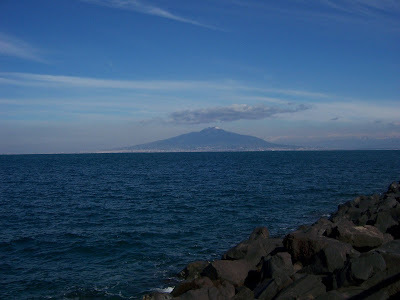 There was a woman from Naples who was killed today on the beach in the city of Praiano. She was on a walkway tucked into the rocks alongside the sea when a large wave crashed against the shore and pulled her out. It is a very tragic story, and an important reminder of the power of the sea. Yesterday the sun came out after almost a week of rain and clouds, and everyone seems to have had the same idea … time for a walk! 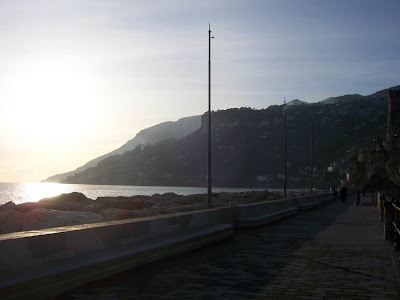 We headed toward Maiori, because this time of year it gets the sunlight longer in the late afternoon than Amalfi, which is my usual favorite city for making a passeggiata, or walk. 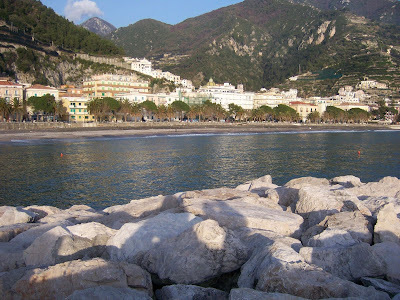 Maiori has a lovely, tree-lined promenade along the sea, and a port with the nice views of the city above. Everyone was out enjoying the good weather, from families, kids of all ages, people walking dogs, doing errands, to friends catching up in the sunshine. These are the moments when you can catch a true glimpse of life here on the Amalfi Coast, without all the hubbub of summer and the masses of tourists. While the weather is certainly not so lovely this time of year, it is a great time to visit the Amalfi Coast if you want to see day to day life here. From the port of Maiori there is also a lovely view of the Amalfi Coast and Ravello, which is particularly nice at sunset. Today it is miserably rainy and foggy again, which makes these few hours yesterday especially sweet!